Once again, Istanbul will host the third High Tech Port to held on 9-12 November 2016 in İstanbul, under the patronage and attandance of the President of the Republic of Turkey HH Mr Recep Tayyip Erdoğan, by the organization of Turkish Undersecreteriat for Defence Industries. High Tech Port is based on Business Development of Defence & Aviation. Ministers, military delegations and representatives from aviation OEMs are expected to attend this event from various countries, including: Qatar, UAE, KSA, Oman, Kuwair, Bahrain, Jordan, South Africa, Nigeria, Morocco, Tunusia, Algeria, Malaysia, Indonesia, Pakistan, Chili, Colombia, Brazil, Azerbaijan, Georgia, Ukraine. High Tech Port was first held on 26-30 November 2014, in İstanbul under the patronage and by the attendance of the H.H. Mr Recep Tayyip Erdoğan, the President of the Republic of Turkey. The first version hosted 71 firms and was visited by 7223 businessmen from 123 countries and total more than 35,000 visitors. 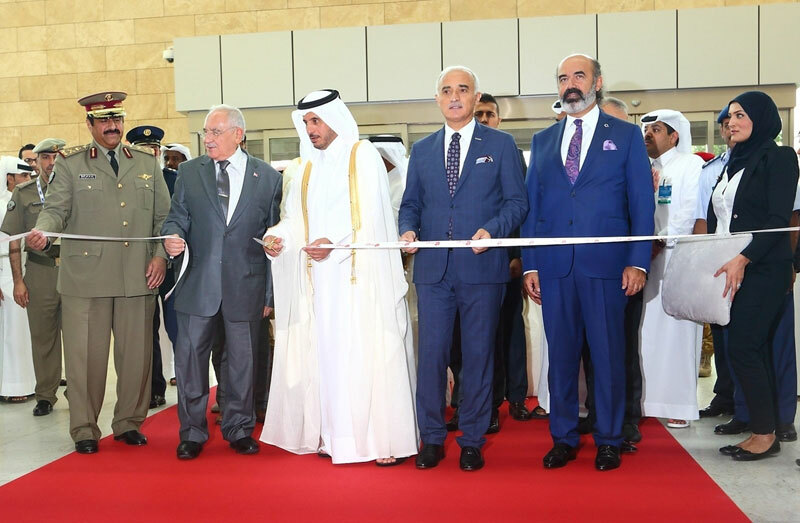 67 strategic firms and institutions attended to the second High Tech Port which was held in the capital city Doha of Qatar on 6-8 October 2015 (photo), with the support of the President of the Republic of Turkey H.H. Mr Recep Tayyip Erdoğan and under the patronage of HH.Mr Sheikh Tamim Bin Hamad Al Thani, the Emir of the State of Qatar. Qatar Prime Minister Mr Abdullah Bin Nasir Al Thani, Qatar Deputy Prime Minister, Qatar Minister of Defence, Qatar Minister of ICT, Qatar Minister of Transportation, Qatar Chief of Defence Staff, Minister of Defence of the Republic of Turkey Mr Vecdi Gönül and Turkish Undersecretary for Defence Industries Mr. İsmail Demir attended to the opening ceremony of the 2015 exhibition and visited the exhibitors. Qatar Armed Forces, Qatar Ministry of Information and Communication Technologies ( ICT Qatar), Qatar Ministry of Interior, Qatar Ministry of Economy and Commerce, Qatari Businessmen Association, Qatar Airways, Qatar Chamber of Commerce and Qatar MANATEQ Industry Zone attended the second High Tech Port which was only open to the mutual participations of Turkey and Qatar and was built as a business development platform. More than 100 meetings with the public institutions of Qatar and more than 500 business meetings with the private sectors firms of Qatar were recorded.